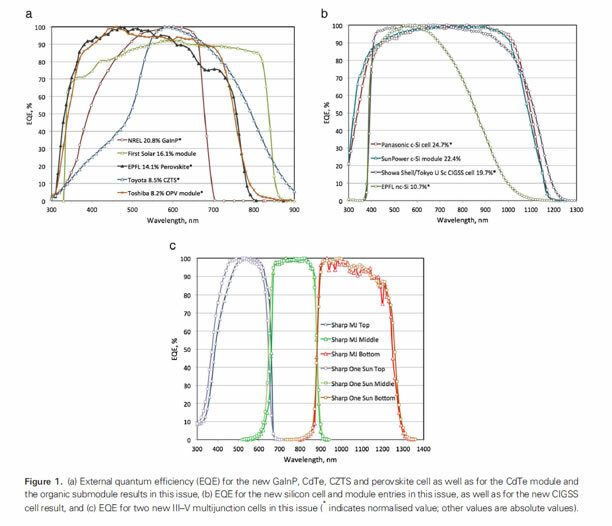 Perovskite solar cell and other solid state solar cells hold much promise to increases in power density for future generations of GCell. Improvements to GCell can be made using Perovksite sensitized materials to enable the reduction of the material bandgap and increase the open circuit voltage by tuning the anions. Our laboratories are working on the next generation of GCell including looking at non-toxic Q-dot materials, reducing the complexity of nanostructure to improve the Roll-to-Roll coating and understanding the associated instability mechanisms. Quantum dots (Q-dots) have been explored as a sensitizer for wide band gap semiconductor materials for the past 15 years. Q-dots provide an opportunity to exceed Shockley-Queissar (S-Q) limit of 31% photo electric conversion efficiency (PCE) with a potential to reach maximum theoretical thermodynamic efficiency of 66%. Internal quantum efficiencies of 80-100% have been achieved using many Q-dot sensitized photo-electrochemical cells (PEC). The Q-dot sensitized solar cell has a unique capability of achieving quantum efficiencies greater than 100% by impact ionization (inverse Auger effect). Q-dots also provide an opportunity to build all-solid-state extremely thin film (ETA) solar cells using a roll-to-roll printing technique and flexible substrate similar to that currently used in the production of GCell. These solid state solar cells could be completely inorganic or organic-inorganic hybrid systems. Q-dot sensitization provides an opportunity to build high performance solid state solar cells using solution processable organic or polymeric hole conducting materials. A new class of materials with Perovskite crystal structure has been shown to exhibit photo electric conversion efficiency (PCE) as high as 15% in Perovskite solid state solar cells. Perovskite was introduced as a sensitizer in DSSC in 2009 by a Japanese team lead by Prof. Miyasaka at University of Tokyo (J. Am. Chem Soc., 2009, 131, 6050-51). The properties of ABX3 type Perovskite materials can be tuned by changing â€˜Aâ€™ (alkyl ammonium, lithium, silver, cesium, etc), â€˜Bâ€™ (lead, tin, titanium, etc) and â€˜Xâ€™ (Fluride, iodide, bromide, chloride) or a mixture of these. Bromide based Perovkite solar cells exhibit open circuit voltage of as high as 1.3V, one of the highest voltage shown by any single junction solar cell. A typical structure of a Perovskite compound (Courtesy: J. Am. Chem Soc., 2009, 131, 6050-51). Commonly used Perovskite-methyl ammonium lead iodide (CH3NH3)PbI3 Q-dots are easily produced by reaction of methylammonium iodide with PbI2. The solution based Q-dots are deposited onto a submicron-thick mesoscopic TiO2 film, whose pores are subsequently infiltrated with an organic hole-conductor spiro-MeOTAD. The use of a solid hole conductor dramatically improves the device stability compared to (CH3NH3)PbI3 -sensitized liquid junction cells.